Hello and welcome to the 2013 Hero Arts Catalog Blog Hop! Please make yourself at home here, take a seat and have a peek at what I have to share with you today. I'm excited to be bring you a peek at some new goodies! How about a little boutique influence? Inspired by my recient visit to Urbanic in Venice, CA. What a dream that store was! I adored the look of all the simple one layer gold letterpressed cards and had to recreate one of my own (sans the letterpressing of course). I'd say mine came out just as cute! To create, I simply stamped this adorable owl (F5725), in gold ink, onto a rustic white card base. Once the ink dried I stamped the sentiment (C5466) in black ink. Just a note, both stamps are wood mounted and stamp wonderfully. Then finished the card off with a strip of black cardstock. Up for a giveaway?! Hero Arts will be giving away several prize packs, with winners randomly chosen from ALL of the blog hop comments received by midnight PST on Monday, December 17. So be sure to leave me some love before you hop away! Now it's time to move on, and the talented Lucy Abrams will be your next stop. Remember, if you find a link that doesn't work, you can always hop back to the Hero Arts Blog for a list of direct links to all the blogs in the hop. Thanks so very much for hopping by! Lovely card!! I love the little owl!! So cute card ! Love it ! I don't know what it is about that owl, but in GOLD, it's awesome! I love the CAS look into all your card creations. I love this owl in gold ink. So pretty indeed. OH So Cute....Love your Perfect Little Card!!!! Love seeing some new HA stamps! Love the simplicity of it and especially the gold! A golden owl, how cute is that! Truly sweet! Love this CAS design, Maile! Love this card... Really love that sentiment. You do simple and elegant like no one else! so cute...I really like this stamp! What a simple and adorable card! That owl is simply adorable...and I love the elegant look of your card! I love simple elegance and that's exactly what this card is all about. Thanks for reminding me how simple can be so nice, Maile. Thank you for sharing a card that any level stamper can attempt and come off looking sophisticated! That owl is so cute. Love your card.! One layer cards are at the top of my "favorites" list. Love the owl/font combo...a classic. Fantastic one layer card! Nice, clean and simple! Love how simple this card is! Lovely CAS card and that owl is just fantastic! The owl is really cute. Loving the new HA stamps. I love that you used gold ink, I wouldn't have thought to stamp the owl that color. It really makes the card pop! What a wonderful card. Clean and simple but filled with elegance with the gold embossing. The gold embossing is very pretty! Cool idea to emboss the Owl stamp in gold....stunning!!! Wow your gold owl is so effective what an elegant card!! Such a cute stamp! Very nice in gold. Love your gold owl!! Great card!! This owl is just too cute !!! Your card is striking! Loving the simple gold owl! That card is way cute! I love that clean, letterpressed look! Love that owl. Such an elegant card. The gold ink gives an elegant look to this card. I like it! so cute! Beautiful CAS card, the gold embossing is so elegant!! Very sweet and simple, lovely. The gold ink just makes that card stunning! Love it! Cute and chic ! Gold owl is a beauty. Love the golden owl! Great CAS card. What a cute simple little card, thanks for sharing! Always awesome . . thanks for sharing! I love owls. I especially love that you stamped it in gold...nice touch! Awesome giveaways!! Great card! God bless! Oh what a super cute card! Love your design and the gold owl looks fab! Boutique style indeed Maile! 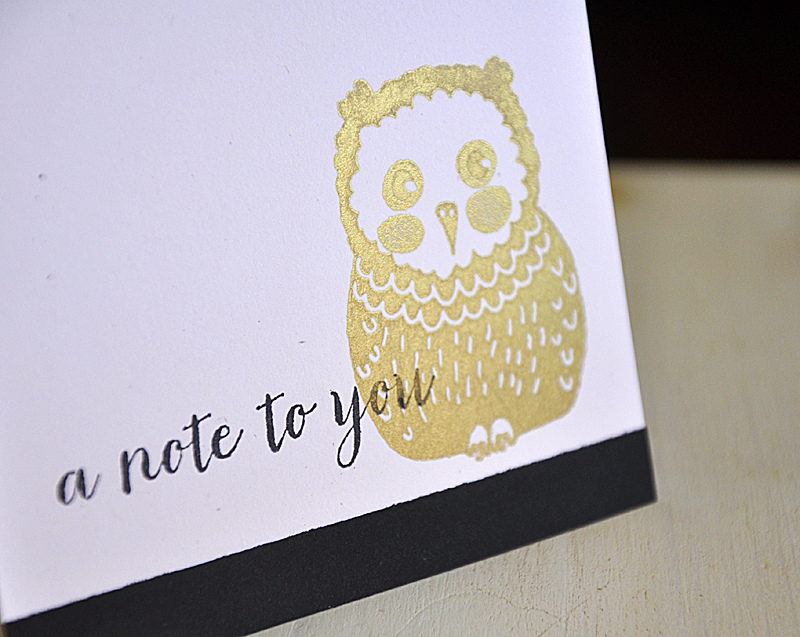 You've made the new Hero Arts owl shine with letterpress elegance in this strikingly simple design! Beautiful card! Love the gold, black and white! Love the gold owl. Great simplicity. this is a terrific clean and simple card. the gold owl really is classy! I just love this little owl in gold! A super sweet and clean card! Oh, such a cute card with the gold owl. This is so sweet, I love the gold! So simple and sweet, love it! This is adorable! Great CAS card! So cute little owl! all gold looks fabulous! I love how simple, but absolutely stunning your card is. I'm beginning to become slightly obsessed with gold ink. I've seen you use it in a lot of your cards recently! I adore the owl stamp! I think I need gold ink and that stamp! Thanks for sharing. LOVE your CAS card! TFS! This card is so sweet and simple! Love it! You card is beautiful, and yet very simply stated. Love it, the owl is super cute. I always enjoy seeing your cards. I love the clean, crisp look of this card. The little owl is just adorable. I like that little owl. It's adorable. Love how your owl shines. Beautiful, love the simple but exclusive look. Your card is gold! Very stylish! Loving all things with owls! cutest owl! so simple and the gold makes it so elegant! I love your style of CAS cards. You always rock it no matter the challenge. Thanks. simply lovely. Gorgeous owl too! You are really rocking that gorgeous gold ink! Love this card!! What a super card. Love the gold owl. Cute card--I love the look of letterpress! I love the look of the gold owl. Very simple and elegant. The gold owl looks very stunning on this card...great job. Love the owl and the way you used it on your card! Nice simple design with a cute owl! So cute, the owl is just adorable. Cute card. Love the little owl. Beautiful card! The gold ink adds a sophisticated feel to the card theme. Love it! What a sweet owl! Does pop out great do to the gold-embossing! 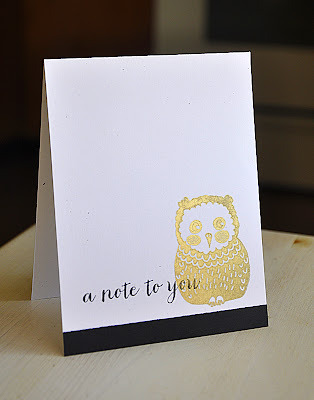 Very simple and elegant card with the gold owl. Really like the owl. Beautiful! I love what you can make with just 2 beautiful stamps! I love owls! Nothing more beautiful! Great job. Darling card! The new stamps are cute! Maille, this owl is adorable and beautiful in gold! Very nice idea and simple design. Thanks! No need for letterpress...your card is absolutely GORGEOUS!!! Love the owl image and I love Hero Arts! The new stamps are fabulous and I love what you created with them. Thanks for the ideas! Such a cute little owl! Love him in gold. my brother collects owls and that stamp's t'riffic; thanx for the inspiration! I'd say you are right...lovely and clean!! what a cute little owl! Great looking card! I love embossing- it adds such a unique, handmade effect. Thanks for the chance to win! Maile, what a great idea to use the owl with just gold embossing. He has all the personality he needs and the card is really clean and simple. Cute owl stamp!! love the gold embossing! Cute card. Love how you embossed the owl. Really cute and simple and so elegant! Such a cute card. Thanks for sharing! Fabulous card! Love that gold ink! Just wondering how well it stamps on darker cardstock. I am really enjoying this Hero Arts Blog hop! There are so many wonderful inspiring creations with the stamps. I am drooling over some of them...I am thinking I need to get some of the background stamps, especially the tweed and hexagonal ones! Cute card, I love that owl! Cute card. love the owl. I love the simplicity of the card. Quick to do, but very elegant. Love your simple and elegant card! Love your card, simply beautiful!!! Love the gold owl. Really cute. So cute. Love the simplicity of the card. Nice CAS card, love the gold embossing. Love the owl. Nice way to make up note cards. Elegant, would make a great hostess gift. This card is so elegant - I love it!! Cute card. The owl is adorable. Love the card, very clean, love the use of white space. SO classic. I love what you did. A note for Whoo? Hee hee. Cute card. The owl is my favorite. Love all the sayings that go with him. Great card-- love the owl. Love the CAS, yet elegant, owl card!! Owl in gold...unusual and effective! Great job!